Am back after much needed rest. Thank you dear readers for sending kind, heart warming wishes my way. 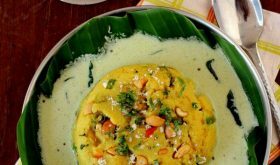 A much cherished and relished vegetable in our home is bitter gourd. 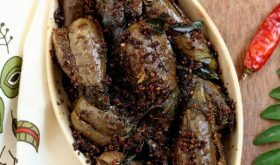 A favorite of mine is today’s bitter gourd pickle with a sweet flavor that happens to be one of Amma’s specialty dishes. 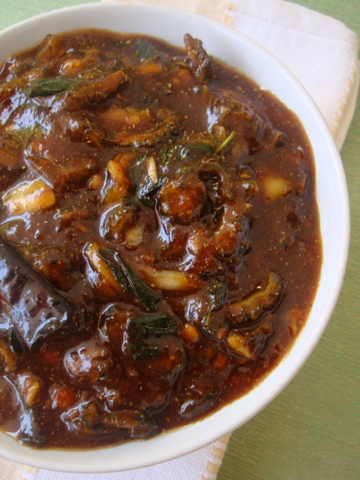 What makes it palate pleasing is the addition of jaggery and tamarind combined with a tempering of curry leaves and dals that add for a bit of crunch. Sweet, sour and tangy flavors that are enticing and addictive. Bitter gourd never tasted better. The bitter gourds you see in the picture above are freshly plucked off the vine. Ensure that you use tender fresh bitter gourd. Discard the hard seeds. Taste and adjust salt and chili powder till it strikes the right balance with the tang and sweet flavors. Keeps well when refrigerated for a few weeks. 1 Cut the bitter gourd length wise and slice as shown in the picture above. Deep fry the sliced bitter gourd to a light brown shade. Drain and keep aside. 2 In a stainless steel vessel, add the tamarind and enough water till the tamarind is immersed. Bring it to a boil and turn off heat and cool. 4 Heat oil in a heavy bottomed vessel, once hot, reduce flame to medium. Add mustard seeds and as they splutter, add split gram dal, channa dal and methi seeds and allow them to turn red. Add curry leaves and crushed garlic and saute for a half a mt on low flame. 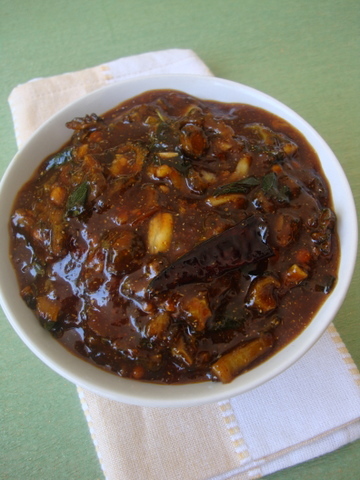 5 Immediately add the ground tamarind-jaggery paste and combine. Add coriander pwd, mustard pwd and methi pwd and combine. Let it cook for a mt on low-medium flame. 6 Add the deep fried bitter gourd pieces and combine. Cook on low flame for 4-5 mts. Turn off heat. If using jaggery, add few tbsps of water and allow it dissolve over low flame. Strain it for any particles and follow rest of the recipe. After a long time Sailu garu you are again posting receipes.. I like this pickle a lot…will try and let you know. Long time. 🙂 How have you been Sailu? 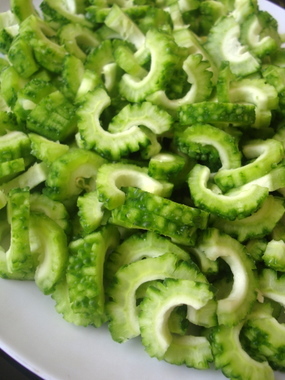 I love Karela, no matter what the dish is. 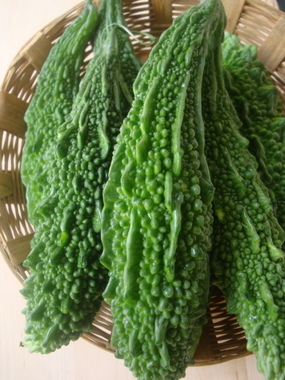 I just got some fresh karela yesterday. Going to try this today. Doing good, Padma. 🙂 Thanks. this is really soooooooooooo tasty. I tried today n got so many compliments. Thank u.
Hi Sailu, Good to see you back. We missed you! Nice recipe and pictures look great. I will surely try this recipe! I am very happy to see recipe after a long time. Nice recipe and will try soon. Good to see you back 🙂 Hope all is well. 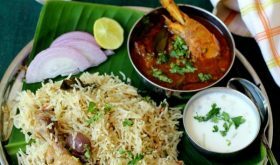 I have been trying a lot of recipes, some of them adapated, some of them as is and all have been appreciated – especially the Andhra Mince Curry and Side dish for Biryani – have also recommended your site to some of my friends who want to try Andhra food and they are happy too! This looks like such a great pickle – we love pavakai too. All’s well, Miri. 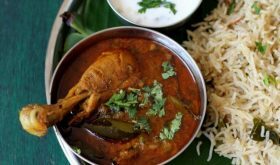 Happy to learn you are trying out Andhra recipes and enjoying them as well as recommending the site to friends. 🙂 Really appreciate it. Nice to see your recipe again after a long wait. Hope to try this in near future. Take care yourself. Hi Sailu , after a long time ..I hope everything is fine with you . Thanks for the new recipe . Good Job Sailu, Sakshi newspaper published your recipe today. 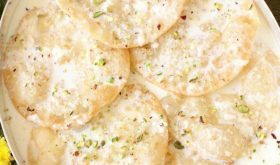 The pachadi looks nice and creamy. 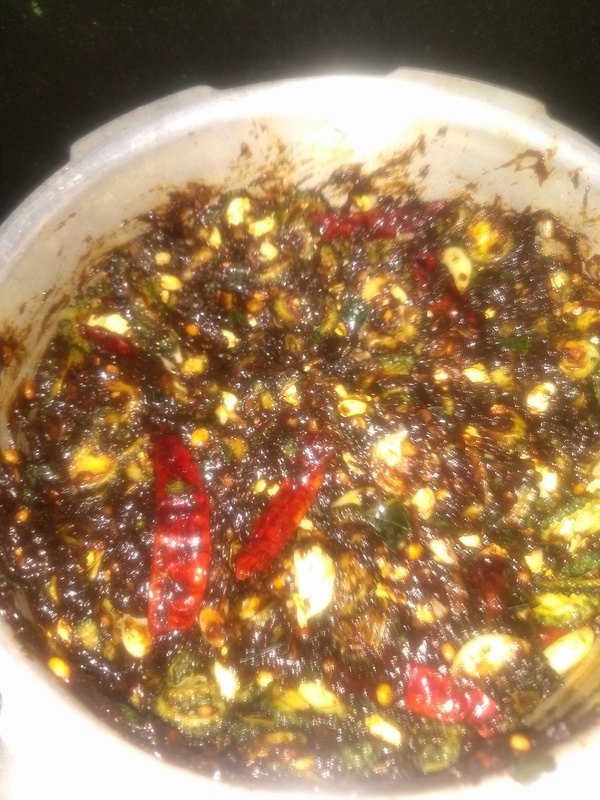 Addition of jaggery and making pachadi with bitter gourd is totally new to me…I always make a fry with it…or simply make pavakkai pitlae…love the dark brown colour too…assuming u must have used the old stored tamarind wich is rich in taste and tang!!! Here’s the link to eggless cake using curd. I tried this for lunch today, along with your aloo dum recipe, needless to say, it tasted great! Thank you soo much! So, so good Sailu! The only heads-up I’d give people is that the tamarind be washed thoroughly, just in case it carries sand/grit. Mine did, although I couldn’t see. I washed it couple times, but the pachadi still seemed gritty at times when eating. Perhaps I should have strained the tamarind pulp before using it? Absolutely. Tamarind needs to be thoroughly washed before use. Tried this for lunch today with your recipe, and taste good. This look absolutely delicious Iâ€™m going to have to make these before the holidays to try them. I don’t want to some red chilies. Would it taste any different? Is the same recipe that I posted here?